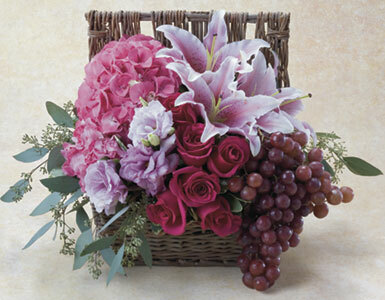 Clusters of stargazer lilies, roses, Hydrangea and grapes in our medium sized grapevine hamper. We offer pink floral arrangements, pink flower baskets, and baskets of flowers for any occasion. We will have your pink flowers promptly delivered to your home or office in Beverly Hills, West Hollywood, Santa Monica and greater Los Angeles area.